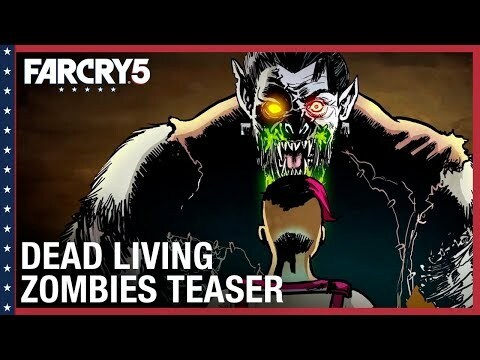 Survive the horrors of Dead Living Zombies, the final DLC pack for Far Cry® 5. Team up with a friend and smash your way through ravenous zombie hordes in 7 thrilling cinematic scenarios. 7 ZOMBIE-MOVIE THEMED MAPS Picture this: zombies and Far Cry combine in over-the-top cinematic mayhem. • Experience 7 action-packed movie scripts as pitched by director Guy Marvel. • Fight the living dead across city rooftops, farmland, military bases, and more. NEW ZOMBIE ENEMIES Come face to face with the walking, running, and thundering dead. • Take down waves of zombies, from agile Gougers to explosive Hot Heads and powerful Behemoths. SCORE ATTACK Challenge your best score to perfect each map. • Unlock Score Attack mode for each map, and surpass the best score to earn one, two, or three stars. • A 3-star rating unlocks weapons and gear you can bring back to the main campaign. Also available in the Far Cry 5 Gold Edition and Season Pass. Far Cry 5 - Dead Living Zombies was released on PC, PS4 and Xbox One 236d ago in the US and the UK. Notify me when Far Cry 5 - Dead Living Zombies is available. Based on 1 Far Cry 5 - Dead Living Zombies reviews, Far Cry 5 - Dead Living Zombies gets an average review score of 68. Guy Marvel's humorous movie pitches are the main reason to play Far Cry 5: Dead Living Zombies.